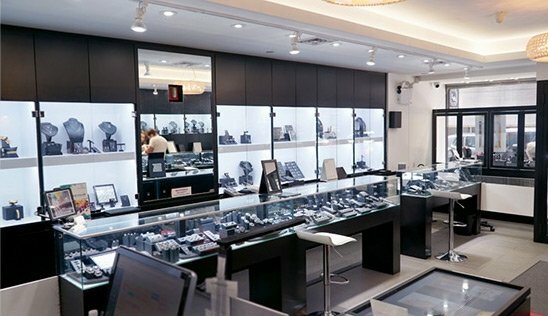 Shopping for an engagement ring is no easy task. Let us help you break it down to get the most bang for your buck and avoid the common pitfalls many encounter along the way. We know ring shopping can be a daunting task and for most people venturing into an unknown and detail oriented world. As is the case with any large purchase, it is best to consult with trained professionals such as ourselves who have many years of experience in the diamond and jewelry business. Remember this is a happy time so have fun with it and although there are many technicalities and details involved do not treat it like a science experiment! Let’s get started! Step 1: Do your Homework: Familiarize yourself with engagement ring terms, qualities, prices and most important styles. Browse the website, look at our online video gallery, and of course our Instagram page to get an idea of design. Some tips when browsing: Start with a broad overview browsing different ring designs and see what catches your eye. If you have always had your heart set on a certain shape then cut straight to the chase and look under that filter. Make a short list of the styles and/or diamond shapes you are interested in. Equipped with your desired styles in mind, set up an appointment to come try them on or email them to us so we can set you up with an associate to guide you further. Step 2: Speak with a Professional: Having an appointment with us is a great way to ensure someone will be available to meet with you and have all your information prepared ahead of time ensuring a proper follow up. If you are unable to visit us in store you can reach out to us by website, phone, or email. We can seamlessly guide you through the process of working with us remotely! Together we will go over your short list and focus on those specific styles. Step 3: Pick the Shape of your Center: It is important to get a general idea of the shape you prefer. For this portion we recommend leaving price and budget out of it- at the end of the day the price is determined by the size/quality of the center diamond along with your budget. Pick the shape you find most flattering on the hand and are drawn to the most in all circumstances. Regardless of carat size, quality, and price we guarantee that you will still enjoy your favorite shape in terms of looks. Remember this is a piece you will have for a while so making sure the shape is your favorite is key! Last of all keep in mind every fancy shape diamond comes in a variety of outlines; from more square to more elongated so be sure to throw that into the equation as well depending on the diamond cut. Metal Color: First select the metal color of your choice for your ring- you can pick from white, rose, and yellow gold. Choose the color you feel works best with your skin tone and your everyday wardrobe. Can't decide? Opt for a two tone ring design featuring elements of both colored and white metal. o The Attachment: The attachment refers to how the halo and diamond connect to the shank and there are a few options: If you prefer a classic design, opt for a 4 stem attachment where the 4 stems holding the halo come to a point and connect directly to the band. Another option, if you want a bit more stability and flow to your ring is adding a cathedral. o Height of Setting : The height of the setting refers to how high the ring will sit off your ring. For a high set, ask for the stems of your ring to be more elongated. Most of our rings are medium-low set for a comfortable feeling on the hand that does not get caught with day to day wear. The Band: Pick your desired style for the band based on your preference. First consider a single row of diamonds. For a daintier look choose our thinnest option. For something a bit more substantial and stronger you can customize a thicker band. You may also consider a setting featuring three rows of diamond alongside the band. Step 5: Create a budget: After narrowing down your choices as far as diamond shape and ring design you are seeking, it is important to set a budget. Our rings depending on the design you pick can be made to most price points. Set a range with a minimum and maximum that you would like to spend. Let your sales associate know about your budget so that we can make suggestions accordingly for you. When buying a diamond you can trade off between different qualities that you deem more important than others; such as going for better color and lower clarity, or a tradeoff of getting a larger diamond and sacrificing one of the quality characteristics. There are many factors that go into the pricing of a diamond, and it is up to you the shopper to determine which ones are most important to you and spend your money accordingly. Step 6: Start your File: Your specific associate will take detailed notes on each aspect of the center-stone you like and the custom setting design you are interested in. 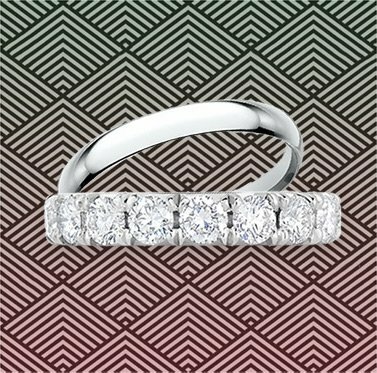 Of course you may have fallen in love with an in stock ring and that’s that! 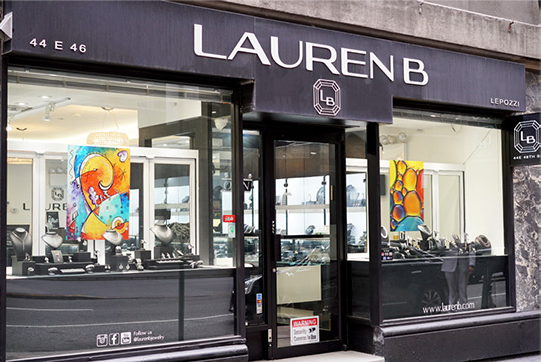 Each customer is assigned to one Lauren B associate. Your sales person will keep all your notes and is your point of contact throughout the ring shopping experience with us. Most rings take 3-5 weeks to create so keep this in mind when purchasing your ring. Some rings can be rush ordered and there may be fees associated with that. Step 7: Finger Size: Get your finger sized and always ensure a snug fit or else the ring will sway side to side since it is top heavy. You want your diamond to remain upright in most cases. We recommend sizing down for a tighter fit with our rings a bit when it comes to thinner bands since it allows for more space on the finger. Step 8: Select your Center Diamond or Gemstone: At Lauren B Jewelry, we always give our customers choices so that they can fairly judge each unique diamond to help them make a decision. Also, you can be certain that the diamonds you are looking at are certified and graded by a recognized third party gemological lab such as GIA. We will either present the diamonds to you in person or we can send you a video along with detailed descriptions and comparisons. This will clearly show you all the nuances and beauty of the stones, which cannot be gained from a still photo or grading report. We will send over the diamond options when you are ready to make a purchase, this way nothing becomes unavailable. Once the gem is selected and your ring design is finalized we will put everything into motion! 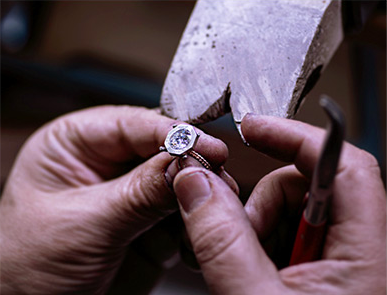 At this time, a 50% deposit is requested in order to remove the stone from our inventory and to begin production on your custom piece. Step 9: After choosing your engagement ring and payment is made, we will provide all the paperwork and an appraisal that will state exactly what it is that you purchased and what the replacement value is. This is very important for insurance purposes in the unforeseen case that something should get lost or stolen. Last of all, do not forget to smile as all the hard work is out of the way and now it is time to celebrate and enjoy this occasion! Or in the simplest terms, what is going to get you the most bang for your buck? There are several ways to go about this however proceed with caution as to not cut any corners that will end up lowering the aesthetics of your ring and lead to an unhappy fiancée. 2. "Spready" Diamond: This tip works across all center-stone shapes and something we focus on at Lauren B. A diamond that is cut deep, (even excellent cuts are guilty of this) will hide weight on the bottom and have a smaller top surface measurement. On the flip side a slightly shallower diamond will really maximize surface area and in many cases give off a finer sparkle. Keep in mind that a diamond that is too shallow will look flat and not have enough depth to reflect any light back out of the stone. This is not an easy one because many times a spreadier diamond will be priced at a premium. 3. Buy Shy: Buying shy means buying a carat weight that is slightly below the “normal” round number markers. For reference, instead of a 1 carat, buying a 0.90 carat, or going for a 1.3-1.4 carat size as opposed to 1.5, and finally a 2.8 carat instead of 3 carat and so on. This works because within a budget you can get a 0.9 carat with superior quality instead of a lower quality 1.0 carat at the same price point. In most instances there needs to be about around 0.20 carats in weight difference to see a significant price movement. In a budget this all allows you to ultimately achieve the look of the carat weight you are after instead of the measured carat weight you want. 4. Choose White Gold Instead of Platinum: In an engagement ring you will save a few hundred dollars by opting for a white gold setting instead of platinum. The wear is slightly different over time (platinum is a pure white metal that remains white) however white gold is equally as strong. We do recommend platinum for most of our delicate pave designs due to the malleability of this metal, but they come just as beautiful in white gold. 5. Test Quality Boundaries: Within each budget category you are going to have options and we recommend testing the boundaries to see where you feel most comfortable as opposed to what people say you should be comfortable with. For example, someone might have it in their mind that they want nothing lower than an E color VS1 While this is a fine quality, and extremely beautiful, someone on a tighter budget will need to reconsider this particular aspect if they want a diamond that is larger in carat size or need to allot more money for the ring setting as well. It is important to see visuals of what you are most comfortable with and get a side by side look to determine what gives you the optimal value. Even if you set your limit at not going lower than SI1, we may be able to find you a completely eye clean SI2 that looks amazing face up, and a larger size or higher color than the SI1 option. This all varies on a case by case basis, and by not setting hard limits and being open minded you will give yourself more flexibility. 7. 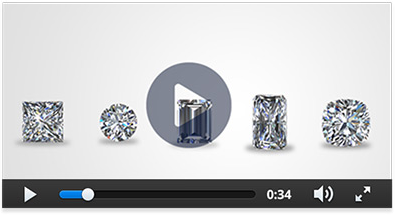 Diamond Alternatives: Consider a moissanite, color gemstone, or CZ center-stone. A very good quality 2 carat round diamond might be $17,000 whereas an equivalent moissanite stone would be around $1600. 1. Weight signifies how large the diamond will look- FALSE The carat size of a diamond relates only to its weight, and its actual diameter faceup measurements can vary. You can have a 2.0 carat round diamond measuring 8.2mm and a 2 carat diamond that measures 7.5m. The measurements will be determined by how the diamond is cut and deeper/heavier stones will appear smaller than shallower ones of the same carat weight. 3. Fluorescence is a negative property for a diamond- False Fluorescence in a diamond is not inherently a negative characteristic of a diamond. In fact, it can have a positive impact on some diamonds giving them a more colorless appearance and can also decrease the overall cost of the stone to put some money back in your pocket. 8. You have to get a matching band for your engagement ring- FALSE There is really no standard way that your engagement ring and wedding band need to look together. Many prefer a contrasting look and go for a thicker band, different metal color or style altogether. There are plenty of ways to pair a wedding band with your engagement ring so let your imagination run free. 9. An engagement ring in its truest form has to have a diamond center-stone- FALSE Gemstones stones such as sapphire or morganite, and colorless centers such as moissanite make amazing center stone options for your engagement. Not only are they cost effective, but they come in a wide range of varieties and pair beautifully with most any ring design. The center-diamond is more important than the setting because you are spending more money on it FALSE the setting will make or break the look and is the truest expression of your unique style. As an example, taking a beautiful D- Flawless diamond and setting it into a poorly constructed setting will not look better than a J color SI1 clarity diamond that is set into a seamless custom ring design.